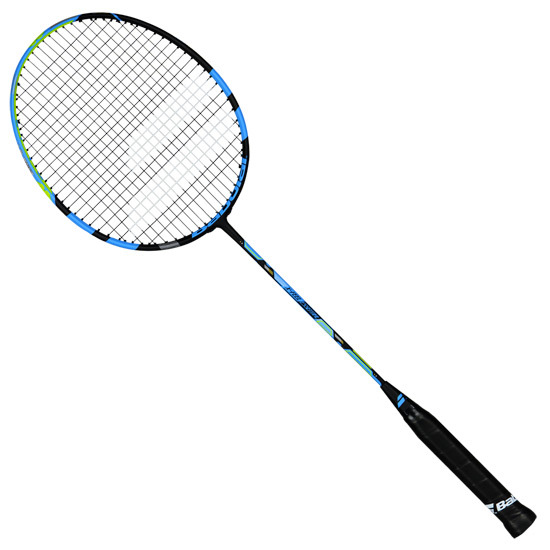 Babolat X-Feel Essential Badminton Racket is a high level competition racket by Babolat. Made for high aerodynamics the string pattern follows the frame for lower drag. A good all round racket that would suit players looking to balance a control game with the ability for a quick explosive smash. Metriflex System in the shaft combines a powerful shaft with precision aim. The bore inside the shaft is oval in shape. This allows improved flexion on the overhead in the preparation phase. When the arm rotates to open the racket face up the stiffer section of the shaft holds the head steady for precision. This gives the benefits of both flexible and stiff shafts. CarbonSlimPlies - A Thinner and stronger carbon formation used in the shaft for a more dynamic response during play. Thinner Shaft - Giving less air resistance, helping to increase swing speed for greater power. XP Aerotubing - A new cross-section design of the racket head for improved aerodynamics and a faster swing. 20x21 stringing pattern to provide more spin and feel. Supplied with a full length cover. Please select if you would like a free grip sent with this badminton racket | Please note rackets that have had grips fitted upon receipt cannot be returned if unwanted. Next Day Delivery available with all re-strings. As the first to introduce web based string upgrades we have the resources and equipment to string both accurately and quickly. If you wish to string the racket yourself please select this option below and we will supply your choice in a packet.